Condition: Item in very good working condition. The flagship of Excite series is designed by three-way scheme with doubled low-frequency sector. Each woofer has 180-mm diffuser made of MSP composite, double magnetic system, cast basket and lighter sound coil wound with aluminum wire. Midrange of a bit smaller diameter (11 cm) is made by similar technology. Like in others Excite models, an original tweeter with a cloth dome with the diameter of 27 mm, impregnated with a special compound, is used in Excite X36. The drivers are mounted on the very thick MDF faceplate, absorbing effectively the parasitic resonances, arising at the work of emitters. The bass-reflex port is placed on the back wall and can be plugged by foam insert - thus the character of playing in LF-range is slightly corrected. The sound of Excite X36 is extremely truthful. 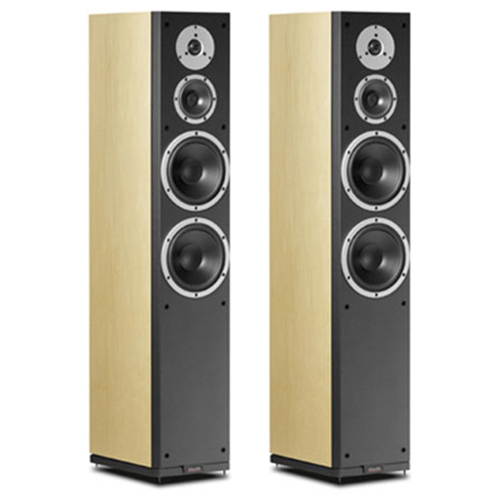 Keeping high sound resolution in the whole working range, the speaker systems easily cope even with the most difficult tonal constructs, for example being typical for symphonic compositions. Rare naturalness, very close to live performance, presents in the voices of soloists. We pleased strictly outlined bass line. Low frequencies have no hint of excessive monotony; their structure is transferred very carefully and with proper dynamics. Sound scene is wide and has a clear perspective. And the space is strictly ordered not only in the central part, but at the edges of virtual scene. 1040 x 205 x 310 mm / 40.94 x 8.07 x 12.2 in. 23,5 kg / 50.6 lbs.